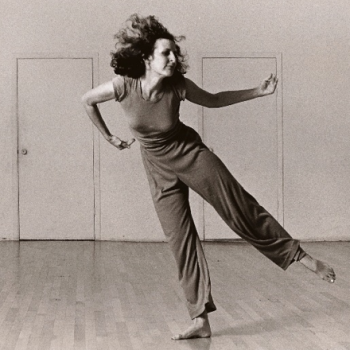 When Is Gaga Like Trisha Brown? In his latest last gaga session in the U.S., Ohad Naharin emphasized what I will call the three E’s: effort, echo, and engine. I’ve heard him say the first one often, as in “Connect to effort,” or “Connect pleasure to effort.” But this time, at the Mark Morris Dance Center last month, he talked more about the echoes in the movement—allowing the movement to start from one place and be felt in another place in the body. Feeling the echoes is a special pleasure and gives you a sense of connectedness. It’s so different from the ballet aesthetic of keeping your center stable and stretching your limbs away from your spine. Ohad Naharin teaching a gaga session, photo by Gadi Dagon. Photo of Trisha Brown by Lois Greenfield. 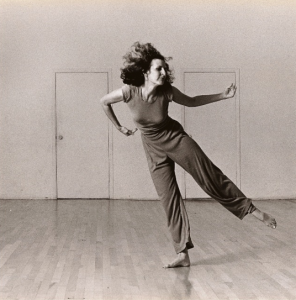 That’s when I thought of Trisha Brown’s ground-breaking solo Water Motor from 1978. Watching the film of this piece, you can see that she is collapsing into water! Gaga is an approach to improvisation, and Water Motor was Trisha’s daring attempt to take the wildness of improvisation and slot it into choreography. She wanted that solo to look as though it were improvised. Trisha was a brilliant, sly, patient, impulsive, unpredictable improviser. She could evade your eye, like Giselle as a Wili slips through Albrecht’s grasp. She could be dancing with you eye-to-eye and suddenly drop to the floor. Collapse. Or, in Water Motor, she would collapse a hip that would spur a shoulder to lift that would cause a knee to swivel. Maybe I’m seeing a connection because I watched Trisha make that solo, a little piece of it every day for months in 1977, when I was part of her company. Below is a YouTube clip of Trisha dancing Water Motor, preceded by Trisha and me showing the phrase called Solo Olos from Line Up, which we made with Trisha the year before. And by the way, my body felt great the day after that gaga class! So you might want to know that MMDC will host another gaga intensive in August. Why Are Some Traditions Valued More Than Others? There are longer traditions and there are shorter traditions. But most dance or art comes out of some kind of tradition, even if it feels like it’s breaking with tradition. In fact, as Bill T. Jones said at a recent talk, “Our tradition was to kill your Buddha,” meaning break the rules of whatever authority you perceive. But even that is a tradition. It’s been the tradition of modern dance to find your own way. Every choreographer had to break away from whoever came before. Graham broke with Ruth St. Denis and Ted Shawn; Cunningham broke from Graham. The whole generation of Judson Dance Theater explored pedestrian movement that Cunningham wouldn’t go near. And then it exploded out into postmodern dance from there. But the ballet tradition is so strong, the virtuosity so visible, that we tend to put more faith in it than other traditions. I’ve been reminded of this general preference from written reviews, conversations, and public talks. There is simply more weight to the longer tradition of ballet and the more obvious virtuosity of ballet. This is why Liz Lerman titled her book Hiking the Horizontal. She didn’t agree with the hierarchy of certain theaters and certain forms of dance being considered the top. Wanting to put all types of dance on a level playing field, she calls her approach “hiking the horizontal.” She’s particularly interested in how to make dances for different populations. Curiosity drives her to research what’s on the horizon. I love ballet and am thankful to Dance Magazine for giving me the opportunity to re-enter the ballet world, which I was very passionate about while I was growing up—before I became a (post)modern dancer. I just wish people would have fewer assumptions about ballet and realize that every genre of dance makes a unique contribution.